If you have been working and using a computer for some time now, you probably how it reacts to your actions when it works properly. It is swift, there are usually no errors and all your work is saved properly so you can access it the next day without any corruption. However, when a driver problem appears, you will certainly notice it. The first thing you will probably notice is that your computers seems to give errors while trying to perform normal actions that didn’t use to cause these problems before. For example, if you have a graphics adapter problem, you will receive an error when trying to run programs that use the graphics card. If you have a motherboard driver problem, your computer will probably tend to freeze up and you need to restart it. In any of these cases you have to check the drivers first. In order to do this, shut down the computer and by pressing F8, access the safe mode. In this mode the operating system will by pass most drivers and use generic ones that function properly. 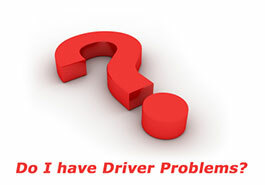 In this mode you can check all drivers and see which one causes problems and why. Maybe you won’t even need to uninstall it and install it again. Sometimes, your drivers will simply mix up the resources they were granted by the operating system and two drivers for two different hardware components use the same system resource bank. By adjusting those settings your drivers will work properly again. In any case, you should be able to notice easily that there is a problem with the drivers. Generally speaking, your computer will show errors when it usually worked just fine. Either change the drivers or fix them as described above and you should have no problems.